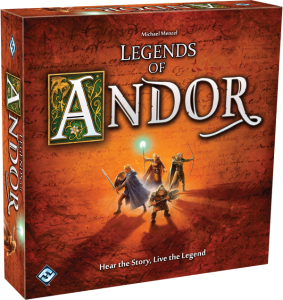 Fantasy Flight Games announces a new board game: Legends of Andor. Fantasy Flight Games is pleased to announce the upcoming release of Legends of Andor, a cooperative adventure board game for two to four players! Revealed last week at Gen Con Indy 2012, Legends of Andor is a unique scenario-based board game by the accomplished artist Michael Menzel. In it, a band of heroes must work together to defend the fantasy realm of Andor from invading hordes.